Love me some prezzies in the mail. A while back I was asked by Portland, Oregon's Urban Airship (Push notification development) to do a couple small projects for them. The favorite gig was designing a t-shirt based on everyones favorite video game resolution - NES-style 16 bit. They made a nice little die-cut sticker out of the airship as well. It was a blast doing the illustration since Nintendo was pretty integral to my childhood. Even now my 5 year old and I have been known to dig out the old console and rock some Super Mario Brothers. 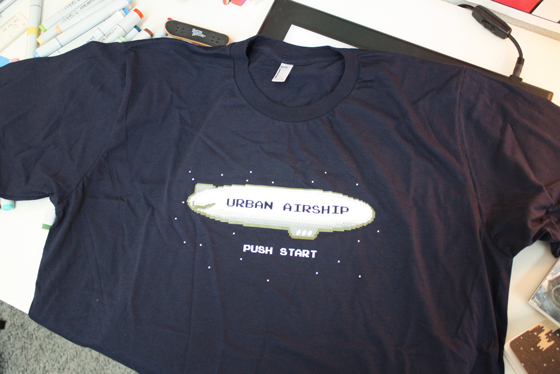 For April Fools Day the company put up a Nintendo style game that utilized the Airship graphic from the shirt. And yes, you could crash and burn oh-the-humanity-style. Unfortunately the game is no longer available (that I could find anyway). Thanks UA for the gig and t-shirt hook up.